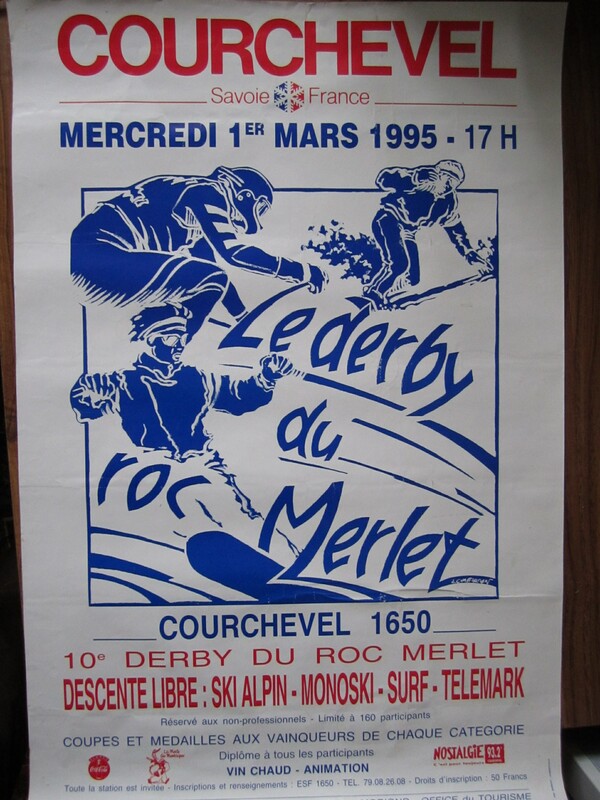 The Roc Merlet Derby in Courchevel 1650 has been one of the classic season worker events since…well, no one seems to be exactly sure when it started. But it was definitely going on in 1995, as shown in this poster. This end of season event sees competitors take a rare chance to hoon from the top of 1650 to the bottom as fast as they dare go in a ‘Chinese’ downhill. Starting at 2500m and dropping to 1600m, it’s not always the fastest descent in the world, but for the amateurs it’s one of the few times you can reach top speed without worrying about taking out a ski school group! It’s a truly thrilling experience that Skipedia highly recommends. Health and safety fears led to it being mothballed for a few years (the lip at the Bel Air restaurant has claimed a few victims), but recently it’s been back, and hopefully to stay for many more years. Thanks to the Courchevel Enquirer for their help in putting this article together. A funny story while out practicing for the Derby in 2004. At least that proves that my copy about the lip at Bel Air is correct! A couple of seasons back the lip at Bel Air wasnt bad .It was the landing in a mogul field with your ski tips nearly hitting your face bump after bump at high speed. finished in a few various placings in the “Derby Du Roc Merlet” with out a doubt one of the more memorable for me personally was finishing in moutier hospital! ok I didn’t go there directly, after bel air lip and a display of several ice burning rotations, a head first trip through the branches of the trees, a splendid birds eye view of the rocks below, a few cartwheels and summersaults, a codine, an attempt at a fondue, someone decided to pack me in an ambo for a trip to moutier, while there I thought it a bit rude not to visit Grandma Jose Chappel from “la Chardon Bleu” 1850, she must of been almost 90 and an icon of Courchevel 1850, she had slipped on ice in the street and was looking a bit worse for it, I must of looked like crap myself really I suppose ! On the plus side you got a day you’d never forget! have a lovely set of turbo charged volkl 223cm downhill babies sitting in the shed that could tell a few stories ! oh how I used to love to click those babies on the feet and have a blast, certainly got rid of the cobwebs !